All maps can be selected by postcode or place name. All come in a choice of Deluxe frames with a pale ivory mount. All maps can be personalised by adding your own inscription. Printed to order on A3 size light cream card, your chosen map will also feature a decorative border. 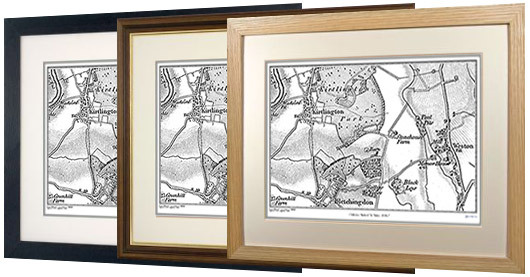 Your map will then be set in a luxurious cream mount and presented in a solid wood frame. *Maps of Scotland are only available for the Dual Maps and for the Single maps using the Old Series, the Revised New Series and present-day mapping.